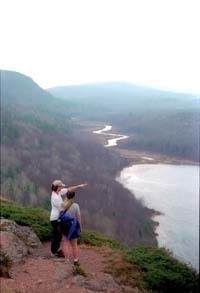 The Porkies, the beloved mountains of the Midwest, are the scenic and rugged heart of the Porcupine Mountains Wilderness State Park in Michigan’s Upper Peninsula. This 60,000-acre park features entire rivers, 25 miles of undeveloped Lake Superior shoreline, dozens of waterfalls, wildlife from bald eagles to black bears and the most extensive virgin forest between the Adirondacks and the Rocky Mountains. The Porkies also offer some of the best hiking in the Midwest. Day hikers and backpackers have more than 90 miles of trails to explore plus 19 wilderness cabins and three yurts that can be rented in advance and 63 walk-in campsites. Hikes can range from a stroll to nearby waterfalls to six-day trek that covers 40 miles. 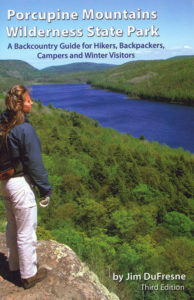 In the only guidebook devoted to the trail system, Jim DuFresne provides backpackers, hikers, campers, cross country skiers and snowshoers with all the information they need to plan a perfect trip to the Porkies. 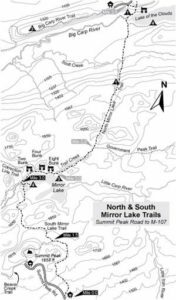 Trail descriptions include mileage, where to camp at night, difficulty and highlights along the way and correspond to more 20 detailed maps. Other chapters cover history, the park’s fauna and flora, fishing opportunities and visiting the park in the winter.